“An Ethnography of Football Fans: Cans, Cops and Carnivals”. 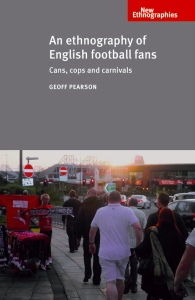 Geoff Pearson will be presenting on the findings of his research on English football fan behaviour, as outlined in his recently published book An Ethnography of Football Fans: Cans, Cops and Carnivals. Based upon 16 year’s participant observation (1995 -2011), Geoff contends that there is a distinct sub-culture of English supporter – the ‘carnival fan’ – who dominated the travelling support at the three clubs where he carried out his research – Manchester United, Blackpool and the England National Team. He argues that the primary motivation of these fan groups is the creation of a carnival – a period of transgression from the norms of everyday life based upon congregating in groups, alcohol consumption, humour and tomfoolery, and expressions of identity. In this, they stand apart from numerous other fan sub-cultures with different primary motivations. In pursuing these aims, carnival fan groups were frequently brought into conflict with the football authorities, police and ‘hooligan’ groups, and Geoff’s observations include some of the most serious instances of crowd disorder involving English fans in the last two decades. His account and explanations of these instances of disorder challenge a number of theories about ‘hooliganism’ and crowd control. Geoff’s research considers the interpretations, motivations and behaviour of the fan groups with a particular focus on issues such as identity and expression, relationships with authority, use of alcohol, attitudes to gender, sexuality and race, and the impact of technology and social media upon football fandom. In order to gather this data, Geoff adopted the methodology of participant observation, for a large period of the research acting covertly. This presentation will also focus on the debates about the use of covert and participatory forms of qualitative research, particularly focusing on the political, practical and ethical challenges that arise, as well as the thorny issue of ‘going native’. After the presentation there will be an opportunity to ask questions about Geoff’s research and findings and also a chance to purchase a signed copy of An Ethnography of Football Fans for a discount. Geoff is a lecturer in law at the University of Liverpool’s Management School where he is part of the Football Industry Group and Director of Studies for their MBA (Football Industries) Programme. Geoff completed his PhD at Lancaster University’s Law Department in 1999, having studied legal responses to football crowd disorder. In carrying out this research Geoff utilised participant observation as he investigated the impact of legislation and policing strategies on fans of Blackpool FC. Geoff continued to pursue his interest in football crowd disorder and policing and legal strategies to control so-called ’hooliganism’ at the University of Liverpool, working with crowd psychologists investigating best practice for policing English fans abroad. In 2005, Geoff was a founding member of the Ethnography at Liverpool and Keele Group, and is on the organising committee for their annual Ethnography Symposium. This role re-ignited Geoff’s interest in ethnographic research and from 2006-2011 he carried out further research, this time with fans of Manchester United, which culminated in the publication of An Ethnography of Football Fans in 2012. This was his second book following the 2007 publication of Football Hooliganism: Policing and the War on the English Disease with Clifford Stott. Geoff has published extensively on the subject of football fan behaviour and management in (amongst others), the Journal of Criminal Justice, the Journal of Criminal Law, Policing and Society, the International Review for the Sociology of Sport, the British Journal of Criminology, and Youth and Policy. He is an acknowledged international expert in this area and has worked with the UK Home Office, the Football Supporters Federation and FIFA, as well as making regular appearances in the media. Geoff has also published on the area of research ethics in Ethnography and the International Journal of Social Research Methodology. He is currently completing a project funded by the European Commission investigating the legality of the UEFA Home Grown Player Rule and is embarking on another major ethnographic with the police looking at the use of discretionary powers.